The 350S also had toggle switches covering eight different voicings of three different instrument sounds: Woodwind, Brass and Strings. These fully analogue transistorised tones could be switched in and out to create combination patches which were then either piped out of the 350S’s hefty onboard speaker, or via 1/4″ jack socket to an external amp. There was vibrato in addition to the wah-wah, and the whole thing was built into an enormous faux-woodgrain case that felt like a suitcase to carry (largely because of the two enormous batteries that powered it all). The moment we set eyes and ears on the 350S we knew we had to do something special with it. Ordinary Stylophones are very much one-trick-ponies, although when you combine them (as in StyloSynth) they become surprisingly versatile. The 350S, by comparison, was built from the ground up to be not only as versatile as a small electric organ, but as expressive, too. When we set about sampling it, it was this inherent breadth of tone and unique transistory character that we were determined to keep – and expand on! You can see the scale of the 350S in the photo to the right, where it’s got a little normal Stylophone sitting on top of it. Clearly this is a beast that demands to be taken seriously… so we did. We decided that it obviously wanted to be a transistor organ. It has the right tones and the right voicings (16″ through to 2″) and the sound is brash and cutting and snarly like a transistor organ should be. So we simply set it free. We gave it the drawbars that Dubreq left off in favour of toggle switches, and we turned it into a fully-blendable drawbar organ, allowing a vast scope of sound-creation possibilities that far outspan the original instrument. There’s a twelve-step drawbar for each voicing (they’re labelled 1 through 6, but there are half-stops in there so you can be really precise when you dial in your patches). Envelope Attack and Release controls widen the kind of tones you can wring from the drawbars, opening up pad sounds, long decays and “reversed” tones (which we love, as you’ll probably spot in the demos). The effects section was chosen and tweaked to reflect the inherently aggressive tone of the transistor innards: Bite (tone) can smooth out the edge of the sound or turn it up, Anger (tube) and Fury (Skreamer distortion) are there to really roughen up the sound and take it where it wants to go, while Vibe introduces some vibrato wobble to make your sounds shimmer. Lush Chorus spreads the sounds in a huge stereo wash, while a modelled Amp Cab takes the edge off the tone, calming the highs and compressing the mids for an instant “live” sound that really pulls the whole instrument together. The controls are designed to be simplicity itself to operate: everything’s visible from the front panel, there are no hidden complications. You just dial in the tone you want and get rocking. 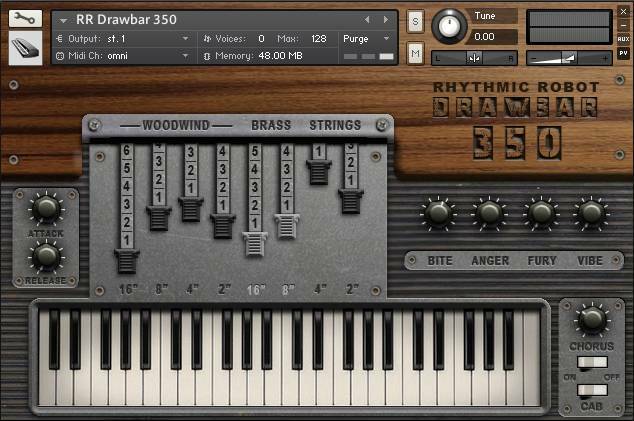 Drawbar 350 is both a homage to the original Stylophone 350S and a departure from it. You can imitate the original 350 perfectly by simply treating the drawbars as on / off switches – either fully out of fully in – and leaving the envelope controls set to minimum. (And why not? It’s a classic, after all!) Or you can go to town and create washes, pads, soundscapes and textures. Or you can turn the whole thing up to 11 for a really aggressive, Punk 70s sound that all but leaps out of the speakers and strangles you. The Drawbar 350 is without doubt a snarling, spitting, angry character at heart, full of attitude and malice. But we’ve given you the tools to tame it and bend it to your will. It’s a sound that you simply won’t find anywhere else: original and dangerous. Welcome to the world of the Drawbar 350. (All our Kontakt instruments require a full copy of Native Instruments Kontakt v4.2.3 or higher (including all versions of Kontakt 5). Kontakt Player is not supported: instruments will load, but will time out after 15 minutes. See the FAQ for further information.) 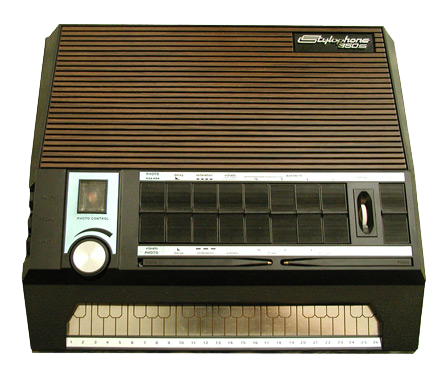 You can read more about the original Dubreq Stylophone 350S here. Groovy rock n’ roll’ish sound, very nice. Stylophone meets organ. Great! I have one of the little stylophone guys, but this is like the Cadillac of Stylos, and then RR-ized which means it’s super usable and flexible too! Excellent sound and easy to dial in various sounds/tones. I would have drug another star up from the depths if presets had been bundled with it. Synthetic yet organic, and full of growl! A cheap way to achieve a big sound, though the ideal release setting seems a bit hard to find – perhaps the right reverb juste after it would do the trick? A very nice instrument to have around anyway. Funky little instrument. Great tone, and can be used to make some pretty gnarly bass sounds. This really cuts through a mix. Sort of like the sound on Human Switchboard’s “Who’s Landing In My Hangar?” I like it in reggae stuff too. It ain’t a B3…….and that’s a good thing! I LOVE this one.